The public sector petroleum company, Oil and Natural Gas Corporation (ONGC), is giving environmental norms the short shrift while exploring oil and gas reserves in Tripura. The Central Pollution Control Board (CPCB) found this during inspection of abandoned well sites in West Tripura and South Tripura districts in the first week of January. State pollution board officials said as many as 20 drilled sites have not been restored despite warnings. They said ONGC activities are causing serious environmental degradation. The CPCB inspections followed complaints from villagers living near exploration sites who objected to ONGC abandoning wells without restoring them and leaving the sites barren. The CPCB report, submitted to the Union ministry of environment and forests (MOEF) on January 17, is said to have indicted ONGC for abandoning the wells they drilled without reclaiming the land. The ministry mandates that drilled sites should be restored before they are abandoned at the time of giving permission to explore forest areas and ecologically sensitive zones. People living in Bishalgarh, 30 km from Agartala, and villagers of Champamura and Putia in West Tripura had complained that ONGCwas ignoring the ministry’s mandate. Kamini Roy of village Putia said ONGC did not even bother to clean the soil at the drill sites where they dumped drill cuttings (solid material removed during drilling) that includes grease and oil. The drilled material is supposed to be disposed in landfills after treatment. 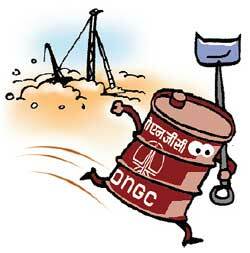 Roy said ONGC has outsourced waste treatment work without bothering to monitor the companies. These companies run mobile effluent treatment plants near all drill sites and are supposed to dispose waste in pits that have lining to prevent contaminants from percolating into groundwater. Roy said the mobile units move on without completing their work. Chairman of the Tripura state pollution control board, Mihir Deb, confirmed that ONGC was not complying with environmental guidelines. “We are not comfortable with ONGC activities and our officers accompanied the CPCB team during the surprise visits to a few drilling sites,” said Deb. The CPCB report was submitted to the ministry on January 17 but MOEF joint director (Northeast) S C Katiyar said he could not disclose the contents of the report. He said the CPCB has made specific recommendations for the oil corporation’s Tripura explorations. ONGChas drilled 17 gas wells in six exploration zones of the state between January 2007 and December 2009. The company’s executive director and asset manager for Tripura, V K Jain, said two well sites have been reclaimed and restored and six others would be restored soon. The wells are spread over various sites including Agartala, Sonamura and Bishalgarh. He said the company stores the top soil (30 centimetre layer) which is later used to reclaim the land and regenerate greenery. The soil is also used for growing plantations in wastelands. “The reclamation is being done as per the guidelines; ONGC has not received any major complaint till date barring a few isolated cases where the drill sites were adjacent to paddy fields,” said Jain while adding corrective actions were taken immediately. Board officials also said that wastewater generated during drilling of well is supposed to be recycled before final disposal. ONGC is not following this rule.